Those wheels photograph a lot lighter than they look in person. As promised, allow me to introduce you to Suzie Q (possibly Suzie Q5?). We signed and took delivery on Thursday afternoon and promptly took a short road trip to snowboard in Wisconsin and I’ve actually had a lot of client visits outside the city. So we acquired her with 17 miles and are up to almost 400 as of writing. I know, she needs a bath. Well, you’ll be happy to know she got a bath later in the day after these pics but I’m too lazy to take more, so this is what you get. I know, I know…it’s grey, it’s not a color, loss of JalOppo Cred. Our first choice of Moonlight Blue Metallic proved to be difficult to find. Every time we thought we found one with the right packages and without those awful 21” rims, it turned out to be a paid order. Daytona Gray Pearl was our second choice, and we’re happy with it. It’s pretty and you know it. I love the new Audi styling. A few harder angles really make a big difference. My only knock on the exterior is the use of fake exhaust tips in the rear bumper trim. A number of manufacturers are doing this now, so I fear it will become the norm. As usual, the attention to style and detail in the headlights really sets Audi apart, in my opinion. They really excel in this area, to me anyway. Quilted Leather and Carbon Fiber, a great match! The interior is beautiful. We were pretty set on getting the Warm Weather Package, which meant no quilted leather but we made a game time decision that we really didn’t want to lose those beautiful seats. Overall the interior design is familiar to the old Q5. The MMI controls have been moved to behind the gear shift, which is fine. My only gripes are that they made the main cupholders slightly smaller, the cup holders in the door more difficult to use (due to the new angles and tighter spaces, larger bottles are more difficult to get out), and the center console compartment now has a sliding tray that while useful, cuts down on the storage space a bit. Also, so much Carbon Fiber. Audi MMI with Virtual Cockpit is fantastic. There are a fair amount of customizations one can make. It is not, as far as I have found, 100% completely customizable, however there are a lot of different view options and layouts. Easy to use and navigate. Pointless touchpad pictured at bottom. Heated steering wheel means we lost the flat bottom “racing” wheel, but no biggie. It’s a nice feature to have as part of the Cold Weather Package. Also part of that package are heated rear seats, which our dogs will love. Heated rear seats. You’re welcome, dogs. The controls feel very solid and well done as well as being aesthetically pleasing. The silver toggles are touch sensitive. When touched they cause a magnification animation of what that button controls (though it’s whatever is directly above them, so neat, but not really necessary). I’m not sure what Audi calls it because I can’t recall them marketing it, but the Eco mode is on by default in almost every drive setting except Sport and Dynamic handling/suspension. I thought I would find it super annoying (like I did back when we had a C300 loaner a few years ago) but I don’t. I actually kind of like hearing it rumble back to life when I take my foot off the brake. There is a simple button to turn it off or on, for now it’ll stay on - unless I’m in the aforementioned drive modes ;). Currently averaging just under 23 mpg. After a few more fill ups we will have a better idea of how it will compare to the ’15 Q5 consumption in real life. 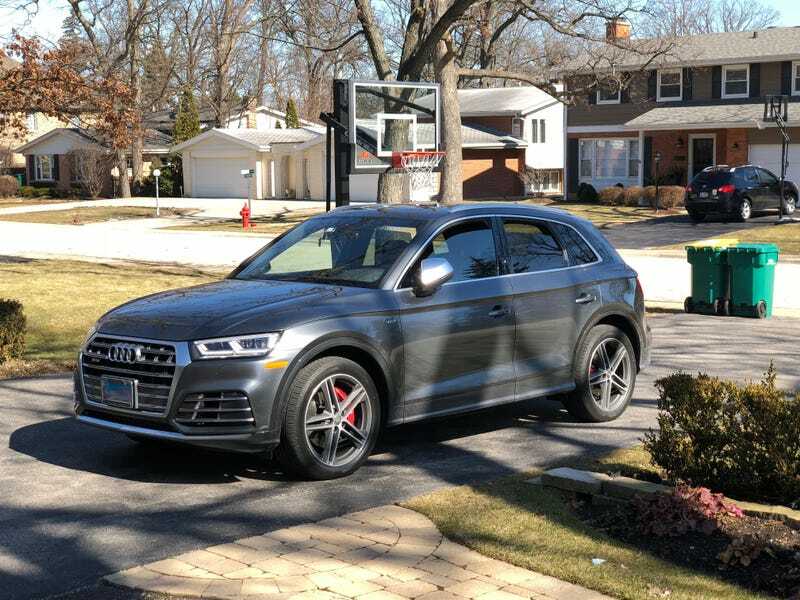 I do think, also, that the ’18 SQ5 tank has less capacity than the ’15 Q5, but am too lazy to look it up. I much prefer these 20" 5 spoke wheels to the 21" wheels that seem to be very popular on these. Also, OOHH red calipers. See: First sentence of Engine section. 0-60 in 5.1 seconds is pretty decent performance to have in a crossover. I love it. There’s not a whole lot to say here, it’s faster than a lot, not as fast as some (or something like that) and, again, I love it. This is another area where Drive Select changes things up. In Comfort mode the handling is responsive but soft and a little loose. In Dynamic mode the suspension lowers and the steering becomes tight and responsive. I’m not nuanced/experienced enough here to truly feel all the little differences, but I do feel them in general terms. Someone who knows more than I can talk about this better. It handles well at any speed I’ve been driving (will neither confirm nor deny any numbers). Ugh, those stupid fake exhaust tips! The only real knock against it. I haven’t died in it, yet, so full mark! It has all kinds of airbags, so that’s a plus. It also has a lot of nanny systems installed. I thought the old Q5 beeped at us a lot, I knew nothing of excessive beeping. Gonna have to mess with these further. Could’ve paid a $10K Premium to have basically the same car with a Porsche badge, however we also could’ve paid a little less to get comparable performance from a variety of cars from a variety of makers. Value is also very subjective, so take my value ranking with a grain of salt, knowing that I love Audi and their S/RS models and feel like they’re worth every penny. Generally speaking here. It’s fast, handles well and is fun to drive. This is a car that is quite happy chugging along in Comfort mode where you give it the occasional punch, and it’s even more at home when you put it in Sport-Dynamic and put the hammer down. Very solid and responsive. Did I mention it’s fun? I’d give that a full mark. So, about those sport seats. They actually, to my surprise, are not as firm and uncomfortable as I’d expected. They’re pretty well padded and I think could be comfortable for hours at a time. The ride comfort is top notch. Easily can spend a long commute in it, or go on a road trip, without having to peel yourself out of it because you’re sore or stiff. Feels solid, feels like the car has a mind and that mind thinks, “Whether you want to get there quickly, fast, or faster, I shall get you there, above all else, comfortably.” I love it. Because a normal puddle light just won’t do. Look at how much ground it illuminates. If there’s a puddle in that 3"x10" area, I’ll surely see it! A truly fantastic vehicle that anyone interested, should seriously consider.